The importance of choosing the right band name cannot be emphasised enough. Case in point: Nailed to Obscurity, whose moniker actually kept me from listening to their music for 12 years, as the associations it created in my mind were exclusively to dime-a-dozen metalcore. When their fourth and latest offering, “Black Frost”, arrived in my mailbox and I gave the titular lead single a spin, however, I immediately felt ashamed — there was nothing whatsoever linking the German outfit to that genre, and instead the style that presented itself to me could hardly have been more relevant to my interests. 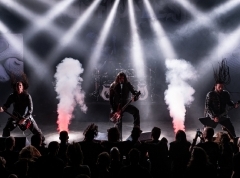 Indeed, the band distills its sound from progressive death and doom metal influences such as Insomnium, Opeth and Paradise Lost, which I remember to be a sound I was quite fond of when I first started dabbling in more extreme forms of metal during my youth. 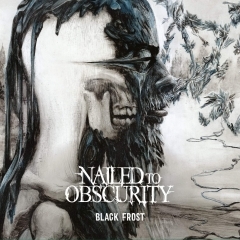 And my affinity for it has not waned over the years either, despite the fact that other genres have taken precedence — which explains why “Black Frost” captured my attention so quickly and so completely when I first heard the album. Opening with ritualistic drumming, obliquitous ringing notes, and a singing voice you could be forgiven for believing it belonged to a certain Mikael Åkerfeldt, the eponymous first track is quick to establish the modus operandi of this Esens-based quintet. Their music is bereft of any conventional means of producing lasting value, with the five musicians instead harnessing the power of atmosphere and multilayering in their quest to woo their audience. It is not a style that suits everyone, but once the song hits the 01:30-minute mark to unveil a soaring, esoteric lead melody and deep, guttural growls by frontman Raimund Ennenga, listeners with a weakness for Opeth prior to 2008’s “Watershed” should at least be on board. Out of the myriad sources of inspiration behind “Black Frost”, Opeth is by far the most important, shaping the way songs like the standout “Aberrant Host” are given room to breathe and evolve, and the freedom to unwind and rewind multiple times before coalescing in an epic crescendo. Listening to either of these tracks is like a journey; one marvels at the lush, mysterious, and at times psychedelic sounds passing by, whilst also being confronted with a plethora of unexpected twists and turns as the two guitarists, Jan-Ole Lamberti and Volker Dieken, bounce jams off each other and veer off on some tangent. Were it not for the grounded, but never dull performance of the rhythm section comprising bassist Carsten Schorn and drummer Jann Hillrichs, their ideas might have proven to be even a little too improvisational to keep track of, in keeping with the spirit of classic prog. As the album proceeds, however, the presence of doom becomes more insistent, dictating the pace and enveloping the music in a darker, bleaker atmosphere that hangs heavy over the likes of “Cipher” and “Resonance” in particular. As the longest track on offer here, the former drags its feet amidst glumly resonating clean notes for some time before the rhythm picks up and a wailing, lugubrious lead erupts from the gloom, signalling a transition away from Opeth worship and toward something more reminiscent of classic My Dying Bride and Paradise Lost. In terms of structure, the song still follows a progressive philosophy, but the funereal tone and sense of tragedy that lingers in the air of its vast soundscape are very much staples of the doom metal genre. And as the track nears its conclusion, it only grows more languid until it gives way to the Katatonia-like apathy of “Resonance”, by a stretch the lightest song “Black Frost” has to offer from a sonic standpoint, and the heaviest in terms of the emotions it invokes. 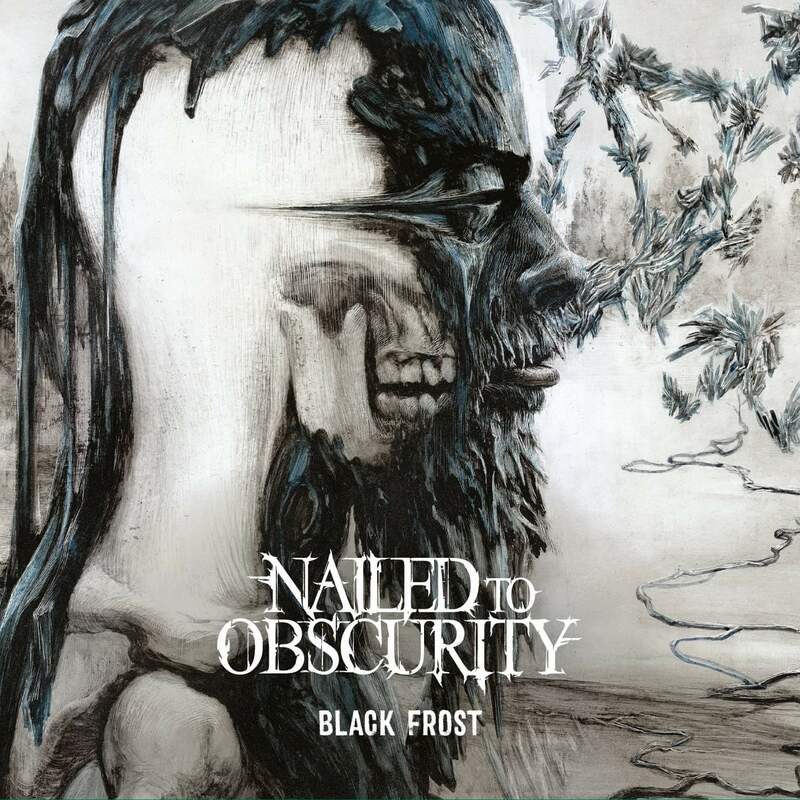 And then, from the doom and gloom it leaves behind emerges “Road to Perdition” to tie the three components that form the basis of Nailed to Obscurity’s sound on this album together. It opens in an almost whispering fashion, once again giving a respectful nod to Katatonia until about 3 minutes in, Hillrichs puts his double pedals to good use and one of the guitarists conspires with Schorn to lay down an old-school death metal groove while a foreboding melody rings in the background. Finally, the composition unfurls with a lengthy, towering outro to bring the album to a deservedly grandiose conclusion, and to earmark “Black Frost” as something of a dark horse in the race to find the best albums of 2019. Truthfully, given how overtly it wears the band’s influences on the sleeve and the amount of dedication it requires from the listener before the rewards are fully felt, the record is unlikely to achieve that status in my book. It also has a slight tendency meander and to bloat the songs unnecessarily in places. But these are minor complaints, and those looking for a fix of nostalgia for progressive death and doom metal as it sounded in the ‘90s and early ‘00s are certain to find lots of satisfaction in these seven songs. And on a more personal level, at the very least the album has managed to deliver a positive surprise and to make a strong enough impression on me to earn a position amongst the artists I plan to keep an eye on in the near future.